Society’s most challenging problems cannot be solved by government and nonprofits alone. The B Corp community works toward reduced inequality, lower levels of poverty, a healthier environment, stronger communities, and the creation of more high quality jobs with dignity and purpose. By harnessing the power of business, B Corps use profits and growth as a means to a greater end: positive impact for their employees, communities, and the environment. Which is purpose-driven and creates benefit for all stakeholders, not just shareholders. To do so requires that we act with the understanding that we are dependent upon another and thus responsible for each other and future generations. B Corp Certification doesn’t just evaluate a product or service; it assesses the overall positive impact of the company that stands behind it. And increasingly that’s what people care most about. Certified B Corporations achieve a minimum verified score on the B Impact Assessment—a rigorous assessment of a company’s impact on its workers, customers, community, and environment—and make their B Impact Report transparent on bcorporation.net. Certified B Corporations also amend their legal governing documents to require their board of directors to balance profit and purpose. The combination of third-party validation, public transparency, and legal accountability help Certified B Corps build trust and value. 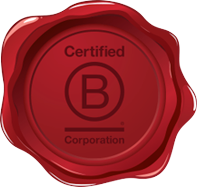 B Corp Certification is administered by the non-profit B Lab. The bakery that supplies Ben & Jerry's with brownies opens its hiring to anyone, supporting community members returning from incarceration with a workforce development and mentorship programs. This leading outdoor apparel company takes responsibility for their entire supply chain, pushing for just working conditions while protecting the environment. This 40-year-old plastics manufacturer works with the local government to help employees move from welfare to a career and diverts 100 percent of its waste from landfills. This $3 billion publicly-traded multinational cosmetics company employs more than 2 million people while producing carbon-neutral products and advocating for the Amazon. The popular employee-owned brewery that diverts 99.9 percent of its waste from landfills has grown to the third-largest craft brewery in the U.S. This Indigenous-owned web services company works with leading organizations to create better social and economic outcomes for Indigenous communities. What's the difference between a Certified B Corp and a benefit corporation? Benefit corporations and Certified B Corporations are often confused. The B Corp Certification is a third-party certification administered by the non-profit B Lab, based in part on a company's verified performance on the B Impact Assessment. The benefit corporation is a legal structure for a business, like an LLC or a corporation. Benefit corporations are legally empowered to pursue positive stakeholder impact alongside profit. Some companies are both Certified B Corporations and benefit corporations, and the benefit corporation structure fulfills the legal accountability requirement of B Corp Certification. Learn more about the difference. How did the B Corp movement start? In 2006, three friends left careers in business and private equity and created an organization dedicated to making it easier for mission-driven companies to protect and improve their positive impact over time. The first 19 B Corps were certified in 2007. Yes! You can search for open positions at B Corporations using B Work, the world's largest impact jobs board. Are there B Corps in my area? Probably! There are Certified B Corps in more than 50 countries around the world. Use our B Corp Directory to search by keyword, location, or industry. B Corp Certification is administered by Standards Analysts at the non-profit B Lab. Standards Analysts are located at B Lab's Pennsylvania, New York, and Amsterdam offices. The standards for B Corp Certification are overseen by B Lab's independent Standards Advisory Council. Are any B Corps publicly traded? Yes! Existing Certified B Corps have gone public, like Laureate and Silver Chef. Publicly-traded companies have also achieved B Corp Certification, such as Natura. Many other Certified B Corps are subsidiaries of publicly-traded companies, such as Ben & Jerry's and Sundial Brands (owned by Unilever) and New Chapter (owned by Proctor & Gamble). What companies have the highest scores on the B Impact Assessment? Each year B Lab releases lists of the Certified B Corps with scores in the top 10% of the community, broken down by size and impact area, called the Best for the World Lists. Check out the 2018 Best for the World honorees! How many Certified B Corps are there around the world? There are currently over 2,500 Certified B Corporations in more than 50 countries. How can organizations get involved beyond pursuing B Corp Certification? B Corp Certification isn't a perfect fit for every organization. Nonprofits, large multinationals, governmental organizations and companies of all sectors and sizes can join the B Economy by using B Lab's impact management and stakeholder governance tools. What is the average size of a Certified B Corp? The B Corp community reflects the world's business landscape, ranging from sole proprietors to publicly-traded companies. The majority of the 2,500+ B Corps are small businesses. Multinationals are engaging the global B Economy both through B Corp Certification and other engagements with B Lab.